This function allows the users to set up the rules of Promotions into the system. Tick on the Active check box if the promotion is currently launching. Enter a Code, Name and Description for the Promotion. Ticket Public - the promotion applies to a type of product only. Payment Mode - the promotion is applied based on customers' payment method. Ticket Unique - this promotion applies to more than one product, the promotion for each product may have a different discount value and different time period. Enter the start date and end date of the promotion. Click 'Submit' to save the promotion. After clicking 'Submit', there will be some new fields appear that need to be filled. Different fields will appear for different Promotion Type. 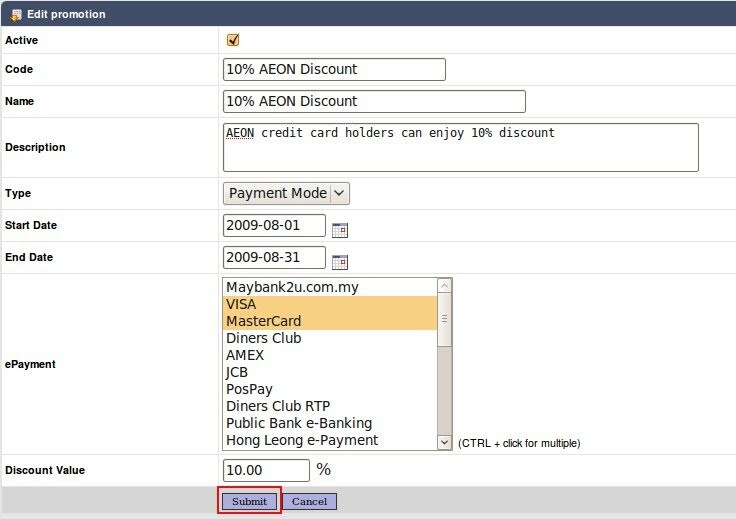 For Payment Mode promotion type, select the payment method and enter the Discount Value. For Public Ticket promotion type, users need to enter the ticket code. The ticket code is a label that used to identified the product. 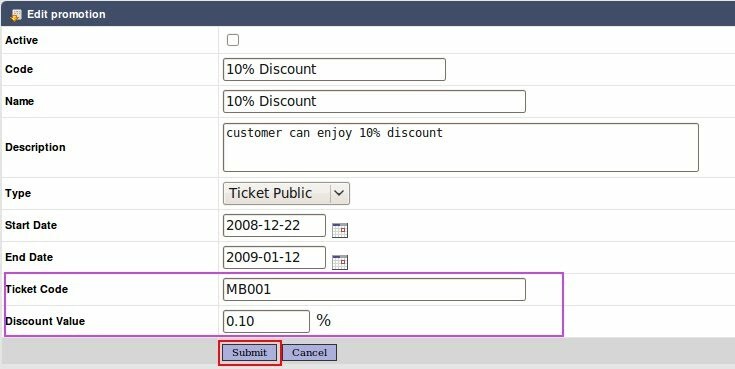 For Unique Ticket promotion type, users have to create Product Ticket. Click 'Add New Product Ticket'. Product Ticket that has been created will be listed in the table below. Enter the Ticket Number and Discount Value. The ticket number is a label that used to identified the product. Enter the start date and end date for the promotion of the product. Click 'Submit' to save after finish entering the details. The Promotion that has been created will be listed in the table. Changes can be made to the promotion under Actions field.